A rabbit Samurai. That is quite a large hurdle for many to overcome. It took me a while to pluck up the courage and finally dive in but I am sure glad I did. Like Blacksad or Animal Farm the animals aren’t the focus of the story merely a conduit to convey solid ideas. By removing human dressing we aren’t distracted by superficial details and can deal with what is important. 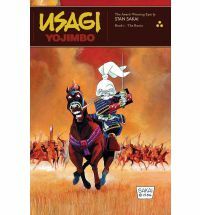 These are traditional Samurai stories of honour, virtue, courage, and friendship retold in a modern way but illustrated with anthropomorphised animals instead of people. The names and places all sound genuine. The language is authentic, with explanations of the period terms, so readers who know nothing of medieval Japan will be able to both follow along with ease and learn something too. This isn’t a Ninja Turtles cartoon this is a grown up allegory. After just a few pages you have accepted that your hero looks like a rabbit walking upright and he talks just like a sixteenth century warrior. The art is outstanding. It is black and white but the framing is pure cinema. The artist captures not only the rapid movement of a duelling samurai but a rabbit one too. There is real motion frozen in the figures and lots of simple but effective tricks to convey the dynamic flow of combat and danger. This is a book of separate tales that appear self-contained. When read together it acts as a giant road movie following the troubled life of our fluffy protagonist. You quickly grow fond of both him and the other recurring characters as you all experience victory and tragedy together. Without question, Thumbs Up!